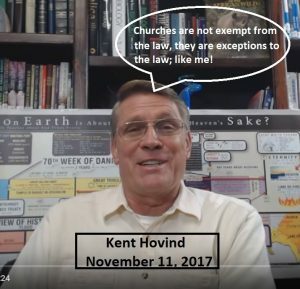 Proposition #67 – Exempt v. Exception – Kent Hovind v. Robert Baty – The Great Debates! We need the Christian influence. American history have been, they’re not tax exempt. I’m sorry, a tax exception. taxes; well, you’re not in Mexico, you’re not a Mexican. to be under that authority. And they let you come out of their authority. I’m not exempt from Swiss taxes. So, churches are not tax exempt; they’re tax exceptions. 26 USC 501(c)(3) exempts from tax entities organized and operated exclusively for religious purposes. 26 USC 508 excepts churches from the requirement that organizations notify the Secretary that they are applying for exempt status under 26 USC 501(c)(3).